On Boxing Day 2018, Olga Mercedes Bautisa and I met at the Zimmerli Art Museum in New Brunswick to talk about her art installation that will be featured in Windows of Understanding, a city-wide public art project, on behalf of the Lower Raritan Watershed Partnership. Windows of Understanding is a project of The New Brunswick Community Arts Council, Mason Gross School of the Arts at Rutgers University and the Highland Park Arts Commission that unites local artists, organizations and businesses to promote compassion and awareness around social justice issues in our community. Olga was paired with the Lower Raritan Watershed Partnership, and has developed sculptural pieces that address pollutant and littering concerns at the heart of the LRWP’s community outreach. Her work will be displayed in Kim’s Bike Shop (111 French Street, New Brunswick, NJ) from January 21- February 28, 2019. Olga was born and raised in Colombia and moved to New Jersey when she was 24. She graduated from Kean University and New Jersey City University with Sculpture and Studio degrees, respectively. Living in Perth Amoby, Olga now travels between the town’s high school where she teaches photography, and her studio. She has also founded and served as director for Perth Amboy’s public art gallery. Check out her website to learn more about her art, and read below to learn about what she found inspiring in her “Windows of Understanding” partnership with the Lower Raritan Watershed Partnership. TaeHo: What was the environmental ah-ha moment that prompted you to address environmental issues through art? Olga: Superstorm Sandy. The roof of my studio was damaged. Since then, I noticed that I was looking for something more… real, something that is representing what is going on. For a long time, I had been working with clay, ceramics, mass media, a bunch of installations. I wanted something more real. The roof incident happened six years ago. That personal moment, partially caused by climate change, motivated me to reflect environmental issues to my art. T: What materials do you use for your art, and what are your processes? O: Right now I use leaves, tree branches and bark that I found after Sandy, and any trash or litter that gets washed into the Raritan River. After collecting this debris, I used the real bark and make a mold out of it by pouring silicon on top of it. 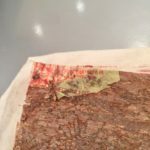 This process allows me to make a copy of the original bark. I then add leaves, trash and other plastic pieces before the silicon dries up to enhance color and texture. When the silicon dries, the material is opaquely visible, and through my assembly I work to highlight interesting words and colors of plastic. These are essentially sheets of a duplicated bark, and I can connect and hang them, shaping them like trees. While on first glance these pieces look like trees, a closer look reveals the bits of plastic and trash. A sheet of faux bark. 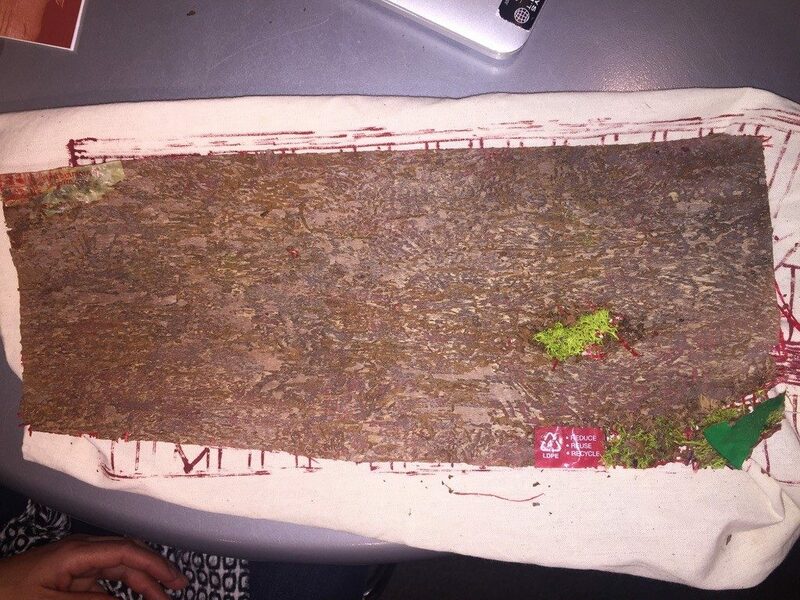 Several sheets will be crafted into “hanging trees” and installed in the windows of Kim’s Bike. T: What is your goal with the sculptural pieces that you are creating? O: The goal of this piece is to portray the plasticity of the world in our impacts on the environment. I hope that the piece creates conversation between people about their plastic use and make people question their own habits and change their behavior to be more environmentally-friendly. I hope they will see the words and logos of big corporations and brands dissolved into what looks like a real tree made of plastic. Many of these companies are responsible environmental harm. Just like this fake plastic tree, if we do not change our patterns of plastics consumption, plastic will take over everything, no? (laughter). And I want to see how people react to the piece. Let’s just see how they react. T: How do your pieces reflect the work of the LRWP? O: Trees are such an important part of the watershed. 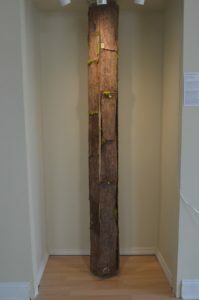 Appropriating and connecting the benefits of trees to my art, I think, resonates with the work of the LRWP. Trees create oxygen, provide habitats for innumerable kinds of species, and hold the soil and water for the health of the watershed. I see these traits of trees as symbolic in its relation to what the LRWP does to restore the environment. Additionally, plastic litter and trash is a huge issue for the Raritan River and tributaries. The LRWP regularly conducts clean-ups of the Raritan and area streams, and gathers hundreds of bags of plastic litter a year. The action of collecting and integrating plastic into my work is important. These materials highlight the littering problem in the watershed. 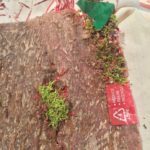 As I explained, my approach is to appropriate real tree bark by introducing leaves with plastics debris to mold a new plastic tree bark. I want to show how the plastic which is used to make shopping bags, plastic bottles, or other items found in abundance as litter and debris during clean-ups is impacting the health of area streams and the watershed. T: Can you tell me more about creating the Resin Piece? O: The process of creating the plastic tree bark involves handling chemicals for a long time, like three hours per day at least. So, creating the piece takes quite a time, especially when I dry the mold in the barks. And being exposed to these chemicals gives me headaches sometimes. Also, during the winter time, it is difficult to work in studio and collect debris from the waterways because of the cold weather. Close up of tree “bark” with plastic bag debris. T: What effect do you think the Windows of Understanding project has on you and the community? O: People will be able to communicate something artistic and unique at commercial places as they see and pass through the area with the projects. I hope they will be curious about how the tree piece is done. Taking a look at the piece inside these commercial places is where the curiosity starts. And they will reflect their lives on this piece and create more conversations with their friends or family. This chain effect will, I hope, create a strong connection between people and the environment. I see the Windows of Understanding Project as a great platform to raise local environmental awareness through art. T: As an artist, what do you stand for? O: The difficult part of being an artist is communicating a message that is going to transcend the beauty of the piece. For example, some might think seeing a ceramic container is nice and pretty and useable or practical, but how the container makes people think beyond that is difficult. That is what I stand for as an artist. Additionally, not only is the transcendental communication part of art important for me, but especially considering the urgency of the issue these days, addressing environmental crises is extremely important. My project, Bonding with Plastic, addresses the daily stress of individuals facing global crises of overconsumption and climate change. Through my sculptures, I want to contribute to a greater awareness of these issues before we reach a point of no return. The opening reception for Windows of Understanding is at the Zimmerli Art Museum on January 22nd. Olga’s art installation will be exhibited at Kim’s Bike Shop, 111 French St., starting on January 21st. From 10-noon on January 21 the Olga and the LRWP will participate in walking tours of the art installations and seed plantings at 10am and 2pm. Description: Join the LRWP and Kim’s Bike Shop as we plant trees and pollinator plants – seeds of hope – in honor of Martin Luther King Day and the kick-off to Windows of Understanding 2019. Participants will be able to take their seedlings home with them. During this semester, as part of my internship, I am conducting interviews with members of organizations which work in partnership with the LRWP. The common goal of the LRWP and its partners is to improve the natural environment of the region. I recently met with Nicole Wines who resides in Highland Park in order to discuss the Raíces Cultural Center and the Raíces Eco-Culture program. Nicole, a co-founder of Raíces, has been with the organization since it was established 10 years ago. The mission of Raíces is “to preserve cultural roots through the arts, history and ecology.” One of its goals is to utilize the performing, visual, and media arts in order to promote environmental awareness. According to Nicole, one’s cultural values should be in harmony with a lifestyle which respects and restores the natural environment. Raíces understands that in every culture there must be a focus which sustains the earth’s ecosystems. It is through an appreciation of the arts that this fundamental bond between humans and their natural world is to be celebrated and encouraged. This “eco-culture” approach is what motivates those who work and volunteer for Raíces. Raíces Cultural Center and the LRWP collaborate on various projects on the path to their common objective: an eco-friendly Central New Jersey. Both groups are committed to sustainable regional ecology, however the groups have not worked together on stream clean-ups. Raíces believes that participating in occasional environmentally friendly acts such as voluntary clean-ups of watershed sites, while helpful to some extent, are insufficient. Instead, Raíces advocates that attention be given to studying and learning from the indigenous peoples of the Caribbean and other regions whose lifestyles are based on an inherent respect for the natural world. The group has determined that it is through understanding environmentalism and the arts that the wisdom of indigenous societies can be combined along with the technological advances of the so-called “developed world.” Through arts programs, all individuals, youngsters as well as adults, can appreciate the importance of environmental sustainability. According to Nicole, excessive consumerism which encourages waste and pollution, should be replaced by the values of those indigenous peoples who respect the environment. As an example of the group’s commitment, volunteers from Raíces, including Nicole, traveled to Puerto Rico to assist those who endured the catastrophic effects of Hurricane Maria. In Aguada and San Sebastian, Raíces repaired roofs. The group also replaced the Agrabond cover for a tunnel at Finca Mi Casa in Camuy. Volunteers provided packets of organic and non-GMO seeds to community gardeners, homeowners, farmers, schools, as well as to organizations which promote sustainable agriculture. Raíces distributed herbal medicines, organic teas, solar lights, and water filters. In Phase 1 of the group’s Disaster Relief Support Initiative, Raíces raised over $10,000 to support recovery efforts. Nicole believes that in future years, inhabitants of regions beyond the Caribbean, including those living in coastal areas of the United States, must become proactive regarding extreme meteorological events. Nicole is aware of the environmental challenges which confront the Lower Raritan Basin. Run-off from nearby lawns and industrial sites pollute the watershed with chemical fertilizers and industrial waste. The proliferation of trash is an ongoing problem. Invasive fauna and flora must be replaced by species which are native to the area. Rain gardens should be established in buffer zones adjacent to the Raritan River which can address excessive run-off. Residents of Central New Jersey as a result of Raíces and the group’s environmental arts programs better understand the need to restore our treasured watershed. 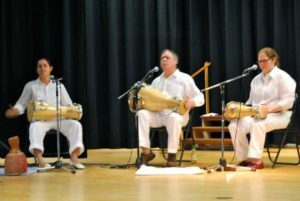 For more information on Raíces and their work and programs: https://www.raicesculturalcenter.org/. Editor’s Note: In 2018 Margo Persin joined the Rutgers Environmental Steward program for training in the important environmental issues affecting New Jersey. Program participants are trained to tackle local environmental problems through a service project. 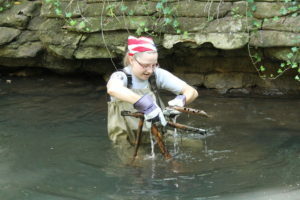 As part of Margo’s service project she chose to conduct assessments of a local stream for a year, and to provide the data she gathered to the Lower Raritan Watershed Partnership (LRWP). Margo keeps a journal of her experiences, excerpts of which are included in the LRWP’s “Voices of the Watershed” column. Fall has arrived in all of its glory to Ambrose Brook. This visit entailed yet another habitat assessment, one of several that have taken place throughout 2018 under the aegis of my Environmental Stewards program project, and most probably the last for this year-long commitment. For this round of measurements, I was very fortunate to have for company, support and assistance Susan E., another Environmental Steward whose project has been an inspiration and role model of sorts for my own. We arrived at the designated spot on the Ambrose Brook at around 10:30 in the morning. The weather was co-operative: high overcast skies, temperature in the high 40’s, variable light wind. It was so helpful to have Susan to aid in the assessment from logistical and safety points of view as well as the advantage of the team work that it provided. 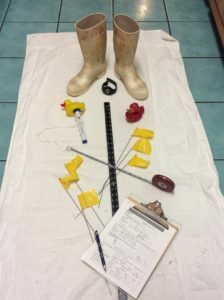 We immediately set to work by measuring out the required inspection distance, placing our flag markers along the designated route, and deciding who would undertake what task for the actual stream assessment of width, depth and velocity, in addition to visually based water conditions, stream and land use characteristic, and high gradient monitoring. To begin, my stream buddy waited at the bank pen and paper in hand while I lurched into the stream for width measurement, equipped with a handy retractable tape measure. I called out the measurement numbers and she jotted them down on the assessment sheets. So far, so good. The next task was depth measurement, to be taken with a rigid metal ruler at various spots along the flag marked course of the brook. I waded mid-stream along our designated route and quickly discovered to my chagrin that my waterproof boots were approximately two inches too low for the water’s depth …. so aside from our official water temperature of 49 degrees taken with a floating thermometer, my feet measured the water temp and gave out a silent primordial scream as the water rushed into said boots and soaked boots, socks, feet, and pant legs. Arrr-r-r-g-g-g-h-h-hhhhh! But I had thought about such an eventuality and had brought along dry socks, shoes and a towel, which were put to excellent use once our foray was concluded. The measurement of velocity proved to be the most interesting to us. At the start of the designated course, Susan dropped in the red plastic duck mid-stream, which began to wend its way downstream toward me according to the force of the flowing water’s current. I used a stopwatch, timed each passage, and called out the numbers. Per the directive on the assessment sheet, we took four readings that varied between less than a minute to slightly over two minutes. However, with the fifth and last release of the duck, we got a surprise. It stopped mid-journey, irrevocably caught in a small whirlpool that was just about invisible at the water’s surface. We were only made aware of this singular current by the round-and-round dance of the red duck mid-stream, and midway between the starting point and presumed ending point. Thus our final measurement for velocity called for a bit of not-so-subtle human intervention in the form of ‘making waves’, in order to encourage the red duck to continue on its journey. The elapsed time for this final reading was four and one half minutes, double the greatest of the previous four. Not only was this a singular event for this round of assessments, but for all the previous ones earlier in the year. No doubt that stream bed conditions created this unexpected duck dance. As a final contribution to the assessment, we took a seat on one of the park benches and worked our way through the rest of the paperwork. We consulted on each of the necessary readings and were able to arrive at mutually acceptable descriptive categories in regard to water conditions, stream and land use characteristics, and high gradient monitoring. A contribution that enriched our observation was that my stream assessment buddy pointed out an additional pipe outlet, presumably for rain runoff, that I had missed completely in my previous observations. Two heads are better than one. So this yearly cycle will soon be drawing to a close, given that I began in December of 2017. I plan to offer some reflections on this journey and offer for contemplation the lesson that have presented themselves to me with the turning of the seasons. Happy Holidays, everyone. On the coldest, windiest day of October 2018, Lower Raritan Watershed Partnership Board Member Amy Braunstein and I met at Hidden Grounds on Easton Ave, a hidden café seven steps below street level, to talk about the LRWP’s new Streamkeeper Program. Amy is the Founder of Friends of Mile Run Brook, and is the LRWP’s first “Streamkeeper” – someone who has committed to stewardship of a local waterway in the Lower Raritan Watershed. Amy has served as Streamkeeper of New Brunswick’s Mile Run Brook for almost a year. Amy has a varied background. She did her undergrad at Rutgers, graduating in 2008 and she recently passed the bar after completing a law degree. She is now practicing law in Newark. While a student, she was an organizer involved in various political campaigns on campus including Tent State and Democrats for Change. She also worked with Food and Water Watch in New Brunswick. She has been an environmentalist since she was a Girl Scout when she had the chance to participate in community clean-ups, but Food and Water Watch reawakened her environmentalism as an adult. TaeHo: Where are you from in Lower Raritan Watershed, and how did you get involved as Streamkeeper for Mile Run Brook? Amy: During my senior year of college, I came upon Mile Run Brook while exploring with friends, and fell in love with the stream. I live right next to it now, on Woodbridge Street. We are right on the municipal border between New Brunswick and Franklin, but also the county line between Middlesex and Somerset. Mile Run and the Raritan are natural boundaries. Living next to Mile Run, I got a pretty good view of a lot of the garbage that was either being dumped in there or washing in there. So I started reaching out among friends and online, just trying to organize some small cleanups on my own. After doing enough cleanups, I wanted to learn more about the actual water quality. And through that I met Heather Fenyk who was active on the New Jersey’s Waters and Save the Raritan River facebook group pages. I asked if anybody had water quality testing kits, and Heather found my Friends of Mile Run Brook facebook page and reached out to me and was like “would you want to help out on these [water quality monitoring] projects?” and then she asked me to help out with formation of the Lower Raritan Watershed Partnership. It’s fine to do things on my own, but working with the Partnership brings so many more resources to the stream, and opportunities to learn more and get more involved in larger watershed issues. T: Could you tell me what a Streamkeeper is? A: A Streamkeeper is somebody that has committed to monitoring the vitals of a particular stream, and to providing stewardship for the ongoing health of that stream. This includes the water quality monitoring that we do, things like measuring temperature, speed, depth, and turbidity, and taking a more holistic approach to the activities going on nearby that might impact the stream and possible areas of improvement. It also includes organizing clean-ups and helping people who want to get involved. That is finding folks that would want to help with this effort. A Streamkeeper takes a stewardship role, above and beyond taking data by looking at who is using the stream in terms of not only human recreation but also fish and wildlife and figuring out things that need improvement. T: Tell me about Mile Run Brook. A: There is a fascinating history with the stream. 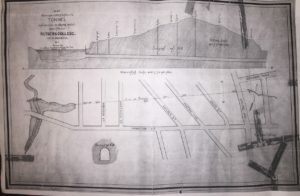 Have you seen the documents about the old mine? A: No, it’s abandoned. Although when they were constructing the Hillel building on College Ave, they found old pickaxes and parts of the dissolved mine. Unfortunately, the reason why this mine opens up over by Mile Run Brook is that, before modern science and human understanding of our effects of pollution on the water systems, people thought water will flush out any garbage left behind and make the area clean, just all of the mine waste and stuff. At one clean up, we found, we’re pretty sure, it was a piece of old coal slab run off from the mine, from the smelting process. And the whole area behind my house is actually a landfill that was capped in the 1930s, I think. And on the Woodbridge St., all of the houses along it were built in the 1950s. Folks would use the stream as a garbage dump. There are pits down there where they found old glass, where they just had been throwing old bottles. Some of these bottles are, in fact, very old. As old as New Brunswick, even. Some of these are hand blown glass. Also – have you seen the name Paulus around? It’s a dairy company in the 1800s in central New Jersey. We found milk bottles from the dairy. This was back when a fleet of milkmen was delivering milk to people. T: And you found it during a cleanup? A: We found it one day when I was just kind of walking around with my boyfriend. Sometimes we walk down there to explore. We’d seen some local folks who would walk down with a bucket and then come back out with a bucket full of old looking bottles. And we’re like, “what’s going on down there?” It’s a fascinating history. You know, there’s been people in and around the stream for a long time. 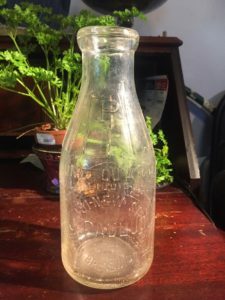 Old hand-blown glass milk bottle from Paulus Dairy that Amy found from the stream. T: What are current challenges of your Streamkeeper work? A: The constant challenge is the garbage that is washed in with the stormwater from residential areas. Storm drains lead to our local waterways and a lot of refuse that gets into our streams that way. Also, unfortunately, there is a lot of dumping. I think that doing anti-littering and anti-dumping outreach in a way that is effective and that actually gets people thinking about the effects of their actions is a challenge. Another challenge more specific to my spot, my geographic proximity along Mile Run Brook, are homeless folks who live there from time to time. Doing outreach with them has been difficult, because there is a lot of fear. When I approach them, they will hear me coming and leave. There’s fear of authorities. There’s fear of having all their stuff stolen. The LRWP has done some great outreach work to these communities in advance of clean-ups. For example, we let them know what’s going on, invite them to join us, and treat them like human beings. The LRWP worked with a social worker to develop outreach material to give them that talks about shelter and food and employment and other social service resources. But, working with those communities, it’s going to be a challenge. We do want to make that bridge, because they can also be great allies, and there are folks that live near the stream, and it shelters them, and they can be another set of eyes. There’s a lot that we share in common. And I think sometimes people just call the police on them and they get pushed out of the spot and it’s unfortunately a long-term problem in our society that needs to deal with. It’s like the lack of housing and shelter for everybody that needs it. These are kind of like big society problems, but also they relate back to the work with Mile Run Brook. Because the way the things are now… a lot of the homeless people don’t want to be seen and so they will just hide all the evidence of them being there like garbage and food wrappers and all that stuff. And the way they hide them is to just throw it down the ravine. T: What are some responsibilities that property owners who live adjacent to streams have to maintain the adjacent water bodies? A: There are two levels: there is legally what is required of them; and then I would say there is kind of like morally and ethically what it is required. Legally, people cannot discharge any fluids or liquids into the streams. Sometimes folks will be doing home model repair and will not take the proper precautions when emptying radiators or changing the oil. And that stuff can get straight into the stream and have an impact. Also, we have a responsibility to not put any other materials into our local streams. 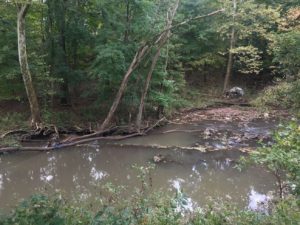 One common mistake that property owners make is just pushing all the leaves, branches, sticks, and debris off of their property and down the ravine into the stream. I mean I think that their thinking is that It’s all natural, it’s not going to make an impact. But this is illegal. And the cumulative impact of everybody pushing all that debris down in there, which would otherwise be scattered evenly on the ground ultimately becoming fertilizers in the waterway, would clog the streams and create stagnant pools. Another issue confronting New Brunswick residents and homeowners is there is a lot of garbage just in general, and sometimes… you live in New Brunswick, right? So you see that garbage gets blown by the wind. So you can clean up your yard but then stuff can blow in and, I mean, really, it’s on each of us to go through and pull that garbage out of our yard. It is not fair. I didn’t throw it there. It blew in. But that stuff ultimately does make its way into either the trees getting caught or into the streams. So homeowners have responsibilities to remove the garbage or litter, before it is blown into these areas. Morally and ethically, there is only so much that the law can require people without being coercive or going too far and saying how you live your life. But, I feel like people should look at the impact that their actions make such as how they mow their lawn or what kind of plants they choose to grow. So, where I am at the ravine is very, very steep, and there is an erosion issue. And there is natural plantings and natural ways to just getting those root systems in place to hold the bank in. Or also leaving old or fallen trees undisturbed, they really serve their purpose in streambank reinforcement. Thinking about the impact of each of our actions when it comes to aesthetic improvements to houses, sometimes we will take them in and there will be a bunch of trees and they’ll want a yard. We don’t get those trees back, not in our lifetime. Maybe in our kids’ lifetime if we’re lucky. So, taking positive actions to improve the areas is something that I think falls more into the area of morals and ethics. One thing the LRWP advocates for that is amazing are pollinator gardens. These are projects the LRWP does in partnership with the New Brunswick Environmental Commission. They will plant milkweed and things that we know that these species are being impacted need in order to survive. Homeowners can easily plant pollinator gardens or native plant species, and they can make choices to not use fertilizers and pesticides. I think doing those kinds of things is really a moral responsibility at this point… Unless each of us tries to make an effort, there is coming a time where there is not going to be enough space for all the creatures of Earth’s biodiversity. T: What would you like to accomplish in the next five years as a Streamkeeper? 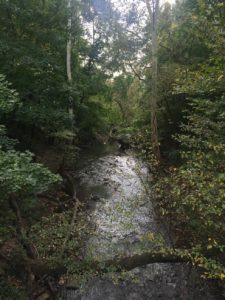 A: let’s see… in 5 years as a stream keeper of Mile Run specifically, I would love for Mile Run to be a stream where people can wade in and fish in and play in as a recreational opportunity. Right now there are issues with stormwater runoff. There used to be a lot of industries along Mile Run – there was a perfume factory and other industrial dischargers dumping directly into the stream. Now the issue is stormwater runoff bringing in trash and other wastes through the stormwater system. Identifying what and where these pollutants are going in and stopping them at the source is goal #1. Maybe we can get Mile Run to be a place where people can really play. I would like to see frogs and lizards and other indicator species return to Mile Run. I would love to see a pathway along the Mile Run so that the members of the public can have a green space to go and recreate in. The more people use it or know it’s there the more they appreciate it. But if it’s just a hidden spot, it’s easier to get trashed and it doesn’t have value. So I would love to see some recreation spaces opened up over there. T: As a Streamkeeper, do you have any messages to others who may be interested in becoming Streamkeepers? Following the interview, Amy took me to Mile Run Brook and gave me a brief tour of a section of the stream, from which her house overlooks. We had to be careful around what looked like a homeless spot and spotted a white-tailed deer darting away. View of Mile Run Brook from Amy’s backyard. On the right of the bank is a homeless community. 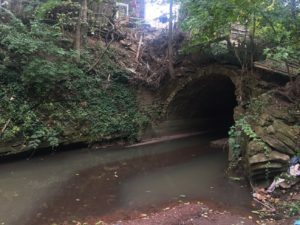 Segment of an old tunnel that Mile Run runs through.